Are you holding on to the fantasy that all the good things that happened at the beginning of your relationship truly define who your lover is? Are you hoping he or she will change and go back to being the ideal partner you initially thought he or she was? Pining for your relationship’s amazing beginning I call leftovers. When food is hot and fresh, and you’re really enjoying it but you’ve eaten all that you can, it usually seems like a good idea to take some home for later. But it never tastes as satisfying the second time, does it? Sometimes it’s still good. It’s just different. The end result usually isn’t fulfilling. Well, the same principle applies to romantic leftovers. When you feel connected with someone, you want more. If he or she doesn’t feel the same, you’re left with whatever he or she is willing to give you. If you choose to starve yourself waiting for whatever crumbs he or she may drop, you most certainly won’t get the nutrition you need or deserve. I let go and move on to find someone better. I‘ve never had this kind of connection before so I hang in there trying to recapture that initial feeling. I hate being alone. Any relationship is better than no relationship. I date other people but still keep seeing him or her. If you answered B) or C) above and you’re indulging in romantic leftovers, I’m hoping you can see what I’m trying to illustrate. I know you feel like you will never be as connected to anyone else as you are to this person. I know no one else makes you feel like he does when you’re with him. But someone else might not make you feel as lonely and empty as you feel when you’re not with him. Someone else might truly love you and make you feel loved. I promise you this: you will never find someone else that you connect with as much as you do with this leftover as long as you are still allowing him to be a part of your life. You will find someone else if you’re brave enough to let go of this leftover. If the leftover you crave was all you ever got to eat, could you survive? Imagine what would happen to your body if you only ate once or twice a month or less. Would you get the nutrients you need? Would you feel good? Would you look your best? If you answered D) above and you are indulging in a hot leftover, I want you to put a nutritional value on the amount of time you spend with him or her. If you couldn’t survive, then throw her out! She has gone bad. She will never again be the person you fell in love with, and you’re too good to wait around and rot while she’s out having fun! I know that is easier said than done when you’re crazy about someone. But it is liberating and empowering when you decide that you don’t want them. Reclaim your power. The person you need to be most crazy about is you! Make a proud declaration that you’re single, rather than in an unhealthy, or bad relationship! 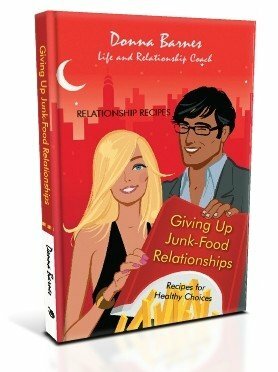 If you’re confused about what went wrong with a great connection, and you’re hungry for a good meaningful relationship, try snacking on my book Giving Up Junk-Food Relationships: Recipes for Healthy Choices.